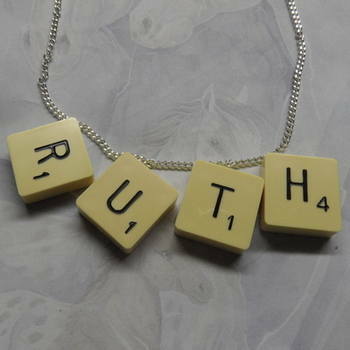 Scrabble Necklace, personalised, just like Ruth Brown on The Voice. Get your Name on a Chain. From £4. Vintage Scrabble letters of your choice corner drilled and attached to a Silver Plated chain. Such a HOT fashion accessory!! Choose the number of letters you want, from 2 up to 9. Can be initials, word, name, etc. Then write letters in correct boxes ie - for RUTH, fill in the first 4 boxes. Choose chain length you want. I recycle Vintage Scrabble letters so your necklace may be made using thick round back black letter tiles or thinner square back black letter tiles. Please make sure you choose the correct number of letters for the necklace you require.